There is a shortage of Gobbles in Marada. With Talon frightened that he will be cooked instead, he has hired a replacement Gurple until December 15th. Gurple is an original Gobble, too ugly and unpalatable to be eaten. Are you brave enough to fight him in the Battle Arena? If you are, accept his quest below and make your way to the arena for a fight! If you win, he will reward you with MP or these new Thanksgiving Prizes that will retire after December 15th. A new Weekly Quest Contest has just started. This week's quest game is Farming. The challenge is to complete as many of these Quests this week. The top 3 players at the end of the challenge will receive a Candy Costume, 200,000MP and a Gold Trophy, the next 6 players will receive 150,000MP and a Silver Trophy and the next 9 players will receive 100,000MP and a Bronze Trophy. The Water Costume was first released in August 2005 in Account Upgrades and the costume has been retired and forgotten about ever since. A new version of the Water Account Upgrade has been released, with 8 new water themed items and 7 random pieces of the new Foxfire Pond Treasure Map. This feature will be released in Foxfire Forest later this week. This AU will retire January 20th. The Azul, Decadal, Rusty and Quell can now wear the Water Costume. The Fasoro and Paffuto have been revamped - we hope you like the changes! A new Weekly Item Contest has just started. This week's item is Bronze Paint, you will need to send this item to the 'Challenge' account. The challenge is to send as many of this item to 'Challenge' this week. The top 3 players at the end of the challenge will receive a Red Peppermint, 200,000MP and a Gold Trophy, the next 6 players will receive 150,000MP and a Silver Trophy and the next 9 players will receive 100,000MP and a Bronze Trophy. A new Weekly Battle Contest has just started. This week's opponent is Cremated, you will need to have a Cremated Trading Card in your Battle Deck. The challenge is to win as many battles against this opponent this week. The top 3 players at the end of the challenge will receive a Nocto Trading Card, 200,000MP and a Gold Trophy, the next 6 players will receive 150,000MP and a Silver Trophy and the next 9 players will receive 100,000MP and a Bronze Trophy. The Lottery has been drawn for this week. doraemily is the winner of the 691,100MP Jackpot with the winning numbers of 1, 6, 7, 11, 16 and 21. Congratulations! Last Week's Raffle has now ended. Musicbuff is the winner of the Red DNA and 100,000MP prize with the winning raffle ticket number 5095! Congratulations! Make sure you buy your tickets for today's raffle - only 10MP per ticket! The Game of the Week has changed to 21 Blitz. The Forest Fairy has been released. The Forest Fairy rewards your pets for the number of items they have played with - with prizes up to 2,700 toys played with. 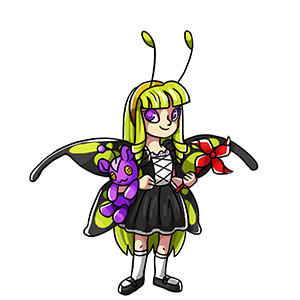 The Forest Fairy has been added to the Foxfire Forest world map and the Rewards page. A new Weekly Quest Contest has just started. This week's quest game is Knutt Knight. The challenge is to complete as many of these Quests this week. The top 3 players at the end of the challenge will receive a American Costume, 200,000MP and a Gold Trophy, the next 6 players will receive 150,000MP and a Silver Trophy and the next 9 players will receive 100,000MP and a Bronze Trophy. A new Weekly Item Contest has just started. This week's item is Grint Notepad, you will need to send this item to the 'Challenge' account. The challenge is to send as many of this item to 'Challenge' this week. The top 3 players at the end of the challenge will receive a British Easter Egg, 200,000MP and a Gold Trophy, the next 6 players will receive 150,000MP and a Silver Trophy and the next 9 players will receive 100,000MP and a Bronze Trophy. A new Weekly Battle Contest has just started. This week's opponent is Excavator, you will need to have a Excavator Trading Card in your Battle Deck. The challenge is to win as many battles against this opponent this week. The top 3 players at the end of the challenge will receive a Crinkal Trading Card, 200,000MP and a Gold Trophy, the next 6 players will receive 150,000MP and a Silver Trophy and the next 9 players will receive 100,000MP and a Bronze Trophy. The Lottery has been drawn for this week. HedgeHog90 is the winner of the 629,800MP Jackpot with the winning numbers of 8, 13, 20, 26, 28 and 33. Congratulations! Last Week's Raffle has now ended. Jessi141 is the winner of the Red DNA and 100,000MP prize with the winning raffle ticket number 4851! Congratulations! Make sure you buy your tickets for today's raffle - only 10MP per ticket! A new Weekly Quest Contest has just started. This week's quest game is Sewer Monster. The challenge is to complete as many of these Quests this week. The top 3 players at the end of the challenge will receive a Autumn Costume, 200,000MP and a Gold Trophy, the next 6 players will receive 150,000MP and a Silver Trophy and the next 9 players will receive 100,000MP and a Bronze Trophy. A new Weekly Item Contest has just started. This week's item is Glowing Plushie Egg, you will need to send this item to the 'Challenge' account. The challenge is to send as many of this item to 'Challenge' this week. The top 3 players at the end of the challenge will receive a Blueberry Freezie, 200,000MP and a Gold Trophy, the next 6 players will receive 150,000MP and a Silver Trophy and the next 9 players will receive 100,000MP and a Bronze Trophy. A new Weekly Battle Contest has just started. This week's opponent is Medusa, you will need to have a Medusa Trading Card in your Battle Deck. The challenge is to win as many battles against this opponent this week. The top 3 players at the end of the challenge will receive a Candy Floss Trading Card, 200,000MP and a Gold Trophy, the next 6 players will receive 150,000MP and a Silver Trophy and the next 9 players will receive 100,000MP and a Bronze Trophy. The Lottery has been drawn for this week. jayyyyy is the winner of the 605,500MP Jackpot with the winning numbers of 3, 5, 6, 12, 21 and 49. Congratulations! Last Week's Raffle has now ended. Maureen is the winner of the Red DNA and 100,000MP prize with the winning raffle ticket number 3097! Congratulations! Make sure you buy your tickets for today's raffle - only 10MP per ticket! A new Weekly Quest Contest has just started. This week's quest game is Shusan. The challenge is to complete as many of these Quests this week. The top 3 players at the end of the challenge will receive a Enpiah Costume, 200,000MP and a Gold Trophy, the next 6 players will receive 150,000MP and a Silver Trophy and the next 9 players will receive 100,000MP and a Bronze Trophy. A new Weekly Item Contest has just started. This week's item is Water Sofa, you will need to send this item to the 'Challenge' account. The challenge is to send as many of this item to 'Challenge' this week. The top 3 players at the end of the challenge will receive a Aura Pearl, 200,000MP and a Gold Trophy, the next 6 players will receive 150,000MP and a Silver Trophy and the next 9 players will receive 100,000MP and a Bronze Trophy. A new Weekly Battle Contest has just started. This week's opponent is Lotus, you will need to have a Lotus Trading Card in your Battle Deck. The challenge is to win as many battles against this opponent this week. The top 3 players at the end of the challenge will receive a Trojan Trading Card, 200,000MP and a Gold Trophy, the next 6 players will receive 150,000MP and a Silver Trophy and the next 9 players will receive 100,000MP and a Bronze Trophy. A new Monthly Mission Contest has just started. This month's mission is Greedy Gertrude. The challenge is to complete as many levels of this Mission in a month. You will earn an extra point for each level you complete. Complete level 1 and receive 1 point, complete level 2 and receive 2 points and so on. The October 2015 Monthly Checklist winners have been announced and the prizes have been rewarded. Congratulations to all of those who have won. Don't forget, this is a monthly permanent feature that you can enter for FREE. If you haven't already, you should start entering the November event! The Lottery has been drawn for this week. chanderp is the winner of the 698,600MP Jackpot with the winning numbers of 7, 25, 27, 29, 37 and 45. Congratulations! Last Week's Raffle has now ended. annatheace is the winner of the Red DNA and 100,000MP prize with the winning raffle ticket number 3311! Congratulations! Make sure you buy your tickets for today's raffle - only 10MP per ticket! The Game of the Week has changed to Moon Racoons. The Mission of the Week has now changed. Earn 50% more MP completing levels of Tarquin's Library this week. Happy Halloween to all of our players! If you are celebrating, we hope you all have a safe and fun time. We hope you enjoyed 2015 Maraween events so far. Remember that all of the Halloween Events will automatically end between November 8th and 12th and their prizes will retire. All Phantom pets will receive DOUBLE STATS at the Gym and Elite Gym until November 8th. All Phantom, Halloween, Phantom, Mad Scientist, Nefarious, Bug, Skeleton, Ghost, Witch, Dark, Zombie, Wizard, Voodoo, Vampire, Goblin, Rotten, Midnight, Insideout, Gothic, Eleka, Killer, Headless, Mutant, Mummy, Werewolf, Nightmare, Monster, Poison or Devil pets will receive FREE TRAINING at the Gym and Elite Gym until November 14th. And all Phantom, Halloween, Phantom, Mad Scientist, Nefarious, Bug, Skeleton, Ghost, Witch, Dark, Zombie, Wizard, Voodoo, Vampire, Goblin, Rotten, Midnight, Insideout, Gothic, Eleka, Killer, Headless, Mutant, Mummy, Werewolf, Nightmare, Monster, Poison or Devil pets will receive FREE LESSONS at the School until November 14th. The Azul, Grint, Leido and Phanty can now wear the Halloween Costume. Can you find these new Halloween Hidden Avatars? The Enpiah Alien 1MP auctions start at 1MP and now only allow each offer to be 1MP higher than the previous offer. This includes the Halloween Alien auctions. Elger has taken the time off from doing quests during this holiday season. Instead, you can visit her with your pet dressed up for Halloween to go Trick or Treating for FREE once every 20 minutes - Phantom Pets can visit once every 15 minutes! All you need to take part is a pet wearing a Halloween, Phantom, Mad Scientist, Nefarious, Bug, Skeleton, Ghost, Witch, Dark, Zombie, Wizard, Voodoo, Vampire, Goblin, Rotten, Midnight, Insideout, Gothic, Eleka, Killer, Headless, Mutant, Mummy, Werewolf, Nightmare, Monster, Poison or Devil costume. These prizes will retire when the Elger Trick or Treat ends November 11th. A brand new Phantom Account Upgrade has been released, with new phantom themed items and either a Phantom coloured Sindi or Knutt Enchanted Plushie. As this is a new costume, the AU will retire in two months on December 31st. The Gonk, Knutt, Sindi and Zola can now wear the Phantom Costume. More pets will be able to wear this costume soon. A new Weekly Quest Contest has just started. This week's quest game is Desert Spy. The challenge is to complete as many of these Quests this week. The top 3 players at the end of the challenge will receive a Baby Costume, 200,000MP and a Gold Trophy, the next 6 players will receive 150,000MP and a Silver Trophy and the next 9 players will receive 100,000MP and a Bronze Trophy. A new Weekly Item Contest has just started. This week's item is Mint Chocolate Leido, you will need to send this item to the 'Challenge' account. The challenge is to send as many of this item to 'Challenge' this week. The top 3 players at the end of the challenge will receive a Wedding Potato, 200,000MP and a Gold Trophy, the next 6 players will receive 150,000MP and a Silver Trophy and the next 9 players will receive 100,000MP and a Bronze Trophy.